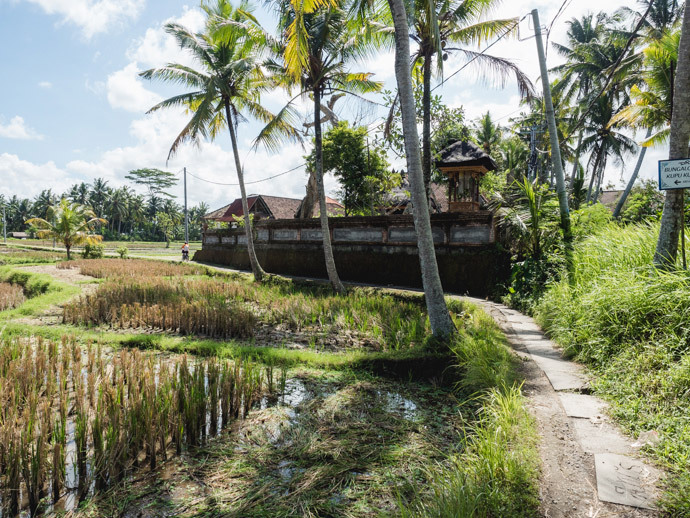 Ubud rice field walks are some of the best things to do in Ubud, Bali. 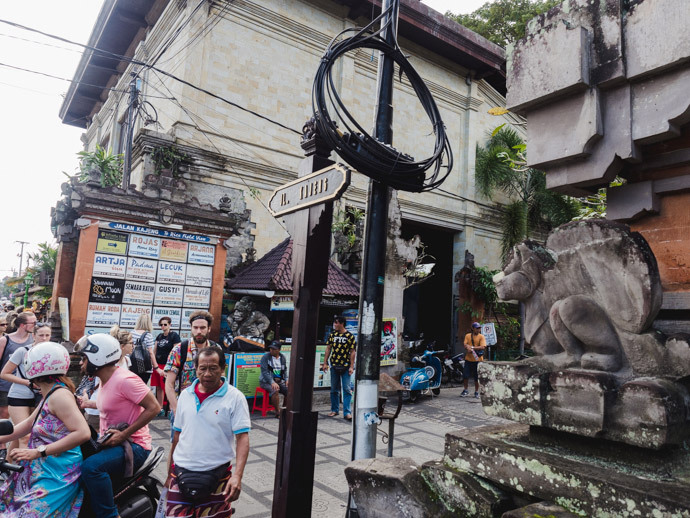 And some of the best can be done just a short walk off the main streets of Ubud Village. 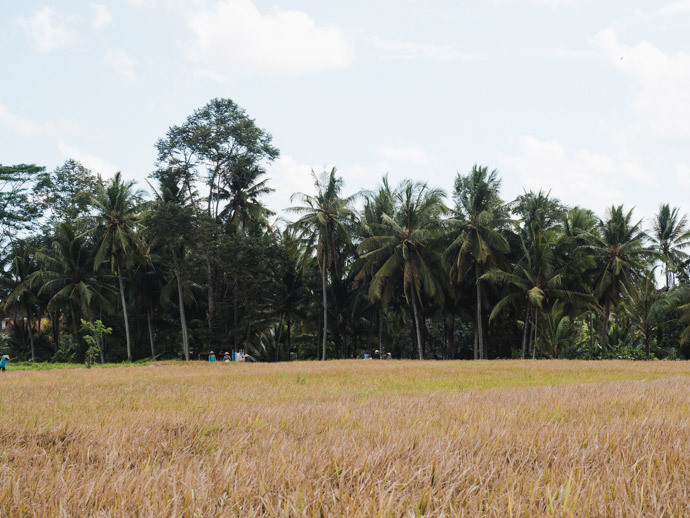 One of our favourite walks in Ubud is the Kajeng Rice field walk, where you will see stunning rice fields and a local village. 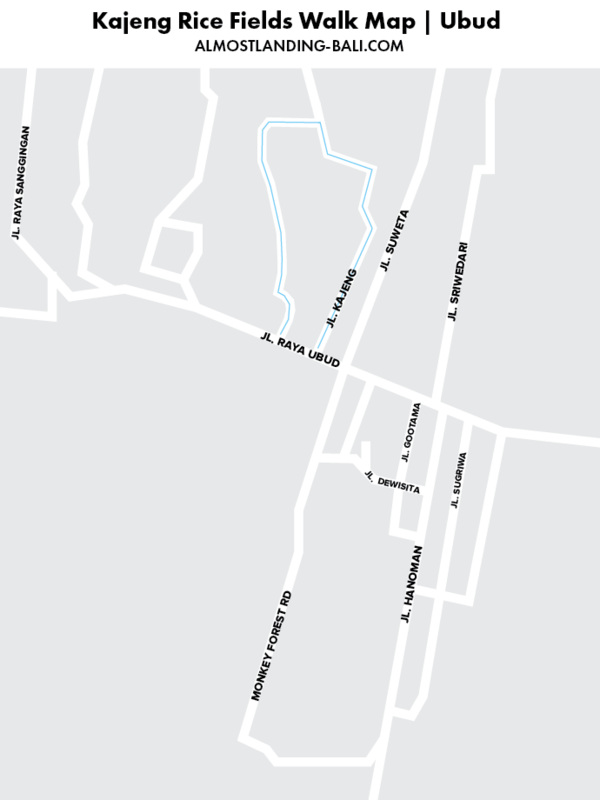 This is now joined to the Subak Juwuk Manis Rice Fields walk, so you can do a complete loop, rather than having to backtrack. What Is The Kajeng Rice Fields Walk? 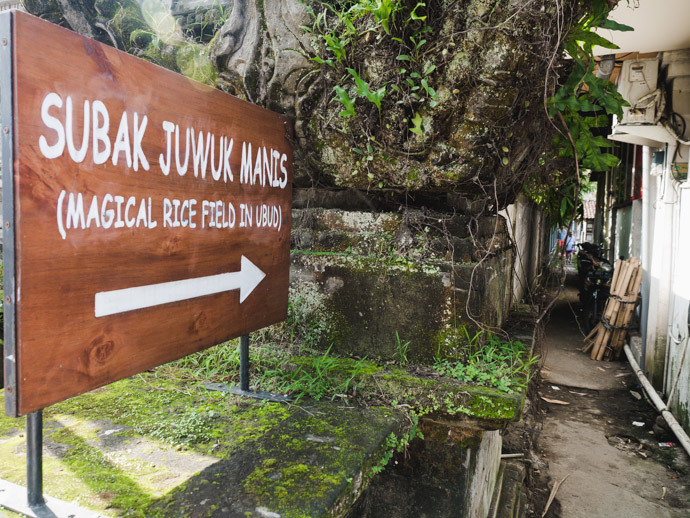 As mentioned, the Kajeng Rice Fields Walk is now joined to the Subak Juwuk Manis Rice Fields walk. This makes the walk so much more enjoyable and beautiful. 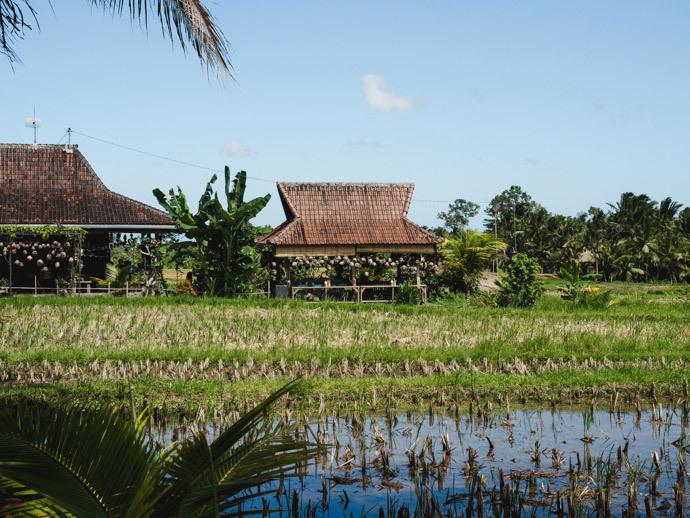 You now get to walk through Kajeng Village, where you will see a less touristy side to Ubud, and then you will arrive at the green rice fields. How To Get To The Kajeng Rice Fields Walk? 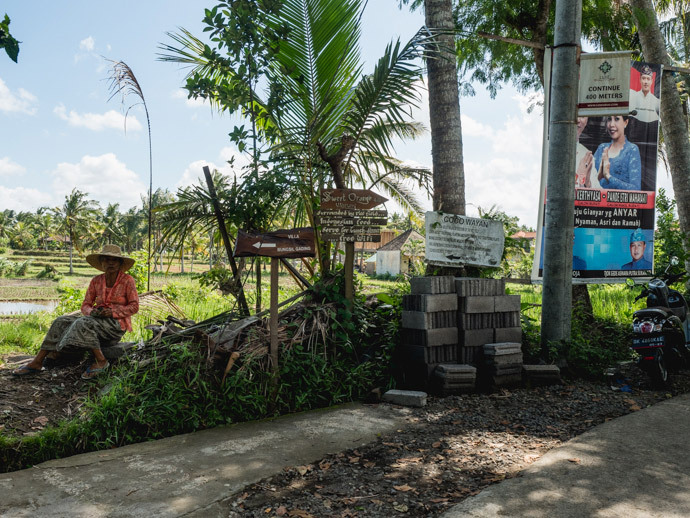 As the Kajeng Rice Fields walk is a loop, you can either start the walk at Jalan Kajeng or you can start it on Jalan Raya Ubud at a sign to a laneway that says Subak Juwuk Manis (Magical Rice Field In Ubud). 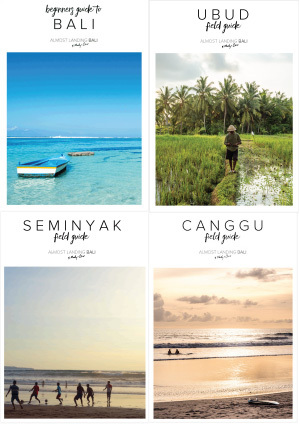 We prefer starting at Jalan Kajeng, but it really doesn’t matter, take your pick! If you start at Jalan Kajeng, you will first walk through Kajeng Village. At some point, you will reach a fork in the road. 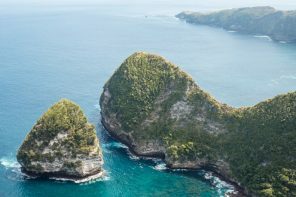 If you walk straight (right) you can continue to explore but if you don’t want to walk for a long time, you will most likely need to turn back. 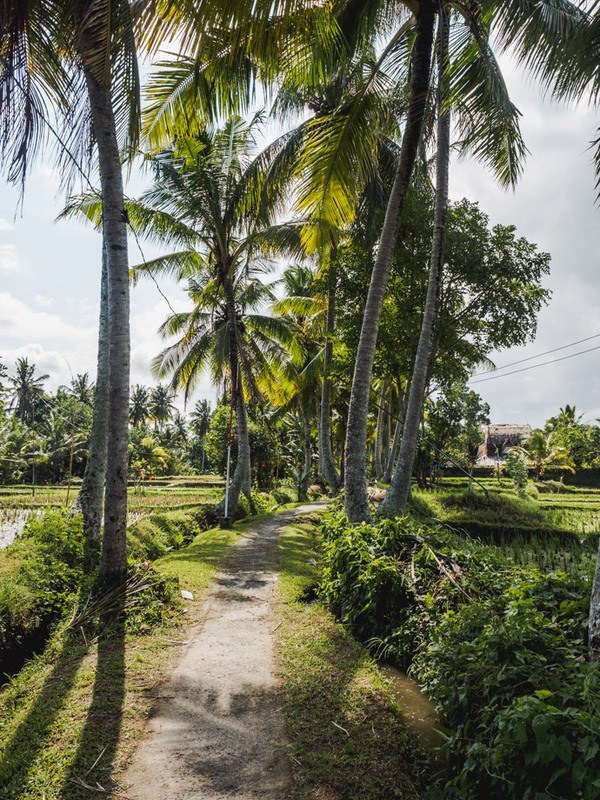 But if you take the left fork, you will continue to walk through these stunning Ubud rice fields, pass Sweet Orange Warung and the walk will wrap back around to Ubud Village. 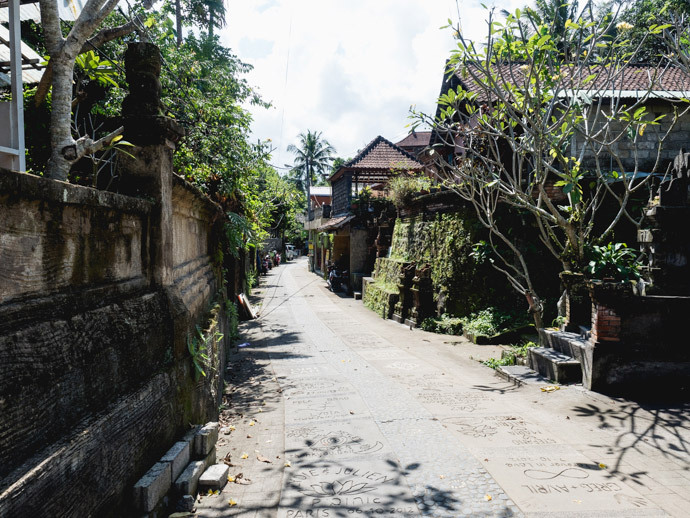 You will re-enter civilization through a tiny laneway onto Jalan Raya Ubud. 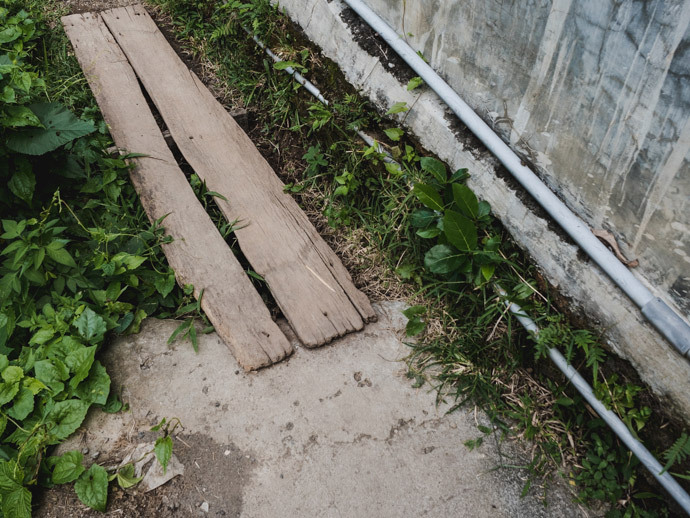 The part near the Subak Juwuk Manis sign is a small laneway with slightly dodgy parts of the path (think wooden planks and skinny path with a bit of a drop off), but it’s still very easy, you just need to be aware. How Long Does The Kajeng Rice Field Walk Take? 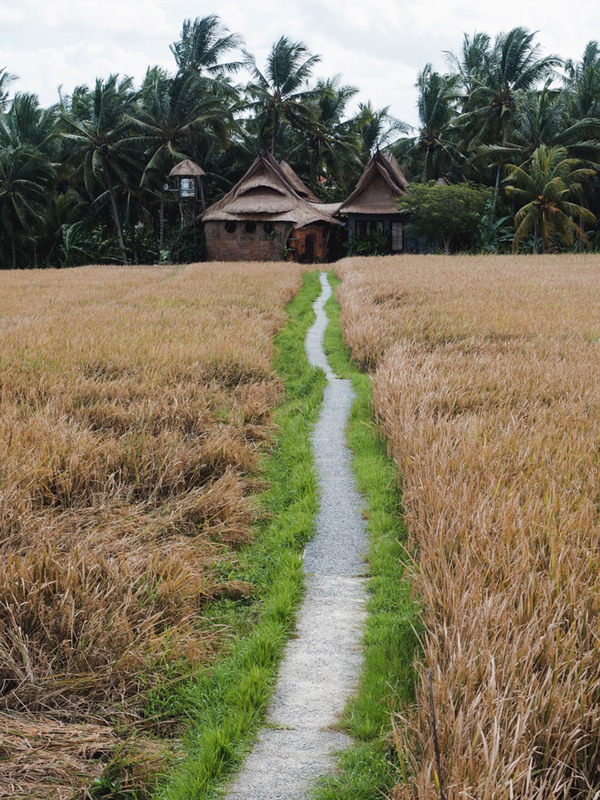 The Kajeng Rice Fields walk takes about 45 minutes to walk the entire loop. 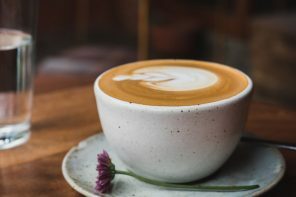 If you want to go slower, allow an hour. And if you want to explore some of the side tracks, perhaps allow 1.5 hours. And If you want to stop off for lunch, obviously allow time for that too. 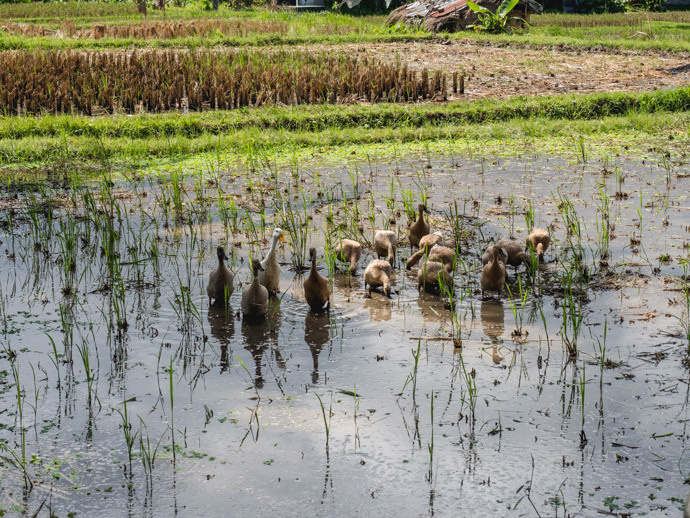 When Is The Best Time To Do The Kajeng Rice Fields Walk? 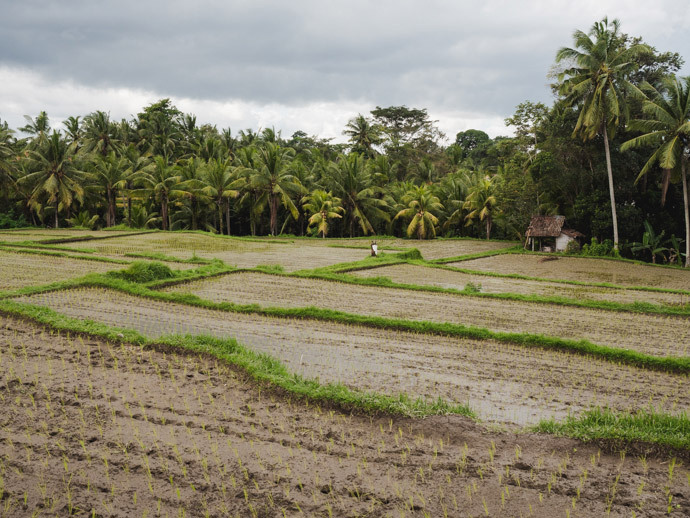 Doing any Ubud Rice Field walk is always great around sunrise or sunset. But this one is also really great around lunch time, as there is a beautiful little warung, Sweet Orange Warung, along the way. Keep in mind it will most likely be hotter at this time of day. 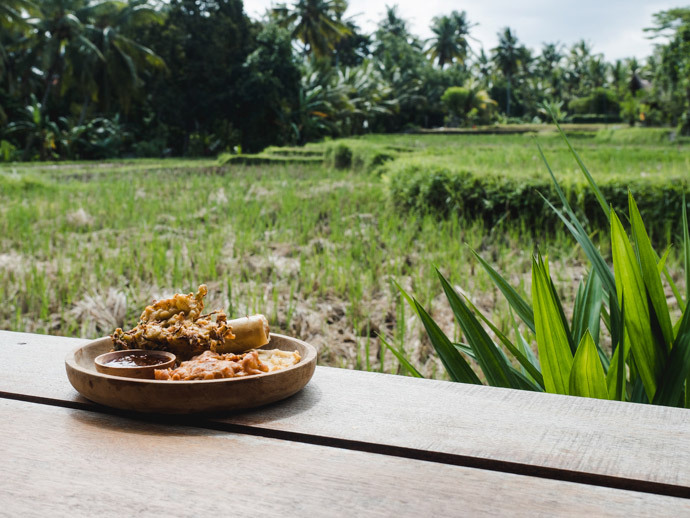 Sweet Orange Warung has delicious Indonesian food, and it’s a perfect mid-way stop. 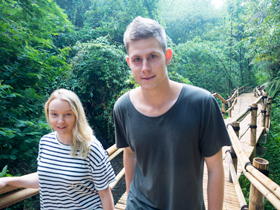 It’s always more comfortable to wear joggers doing Ubud rice field walks. But, having said that, it’s not a strenuous walk, so if you want to wear flip-flops or other shoes, it’s entirely up to you. We’ve done this walk in both joggers and flip-flops and both were fine. It’s a good idea to bring a water bottle as it can get hot, and on that same note, a hat and sunscreen. 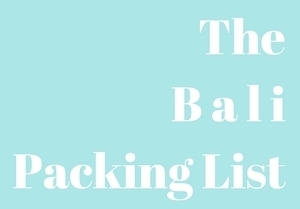 You can get food and drinks at the beginning and about halfway along the walk. 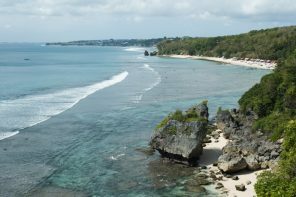 And lastly, the views are stunning and you will want to remember them, so of course, bring a camera. 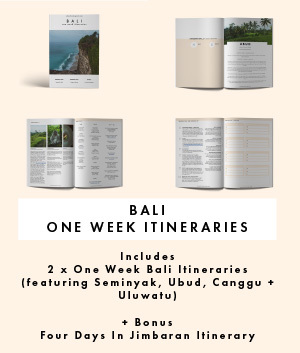 More walks in Ubud that we love include the Sari Organik Walk and the Campuhan Ridge Walk. 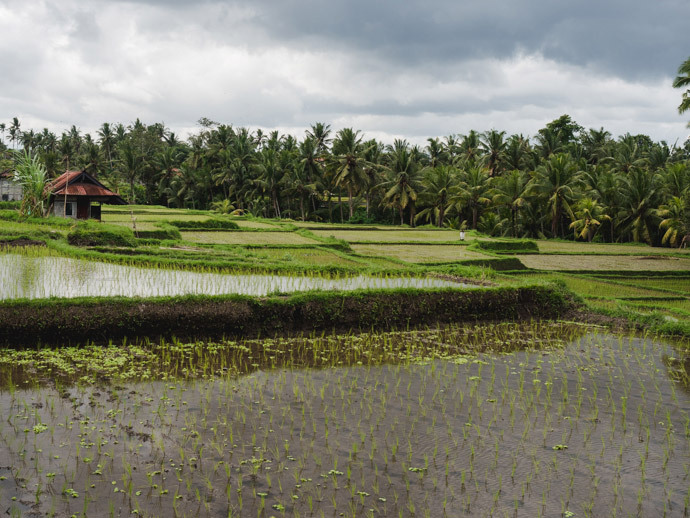 If you are looking for more rice terraces, you can also go to Tegalalang Rice Terraces, about a 20-minute taxi out of Ubud, but they are much more touristy.